Don't shout at your disks! The big question however is - of what use is virtualization on a mobile phone ? From an end user's POV the answer can probably be - portability. Suppose, i use a Nokia phone with all my favorite apps to check mail, measure and record my running speed (with the GPS), play various video formats, read bar codes etc etc. Moreover, I store and backup my contacts using Nokia provided s/w which stores them in their (possibly) proprietary format. Now, suppose, for some good reason I wish to migrate to another platform, say Windows Mobile, I would have a hard time adjusting with the new setup. More importantly, I'll have to find and buy new software for the new phone to suit my needs. Instead, if i could run whichever mobile OS i want on the hardware i own, then i would get the benefit of portability and easy migration. I would be able to run my Nokia apps as well as take the advantage of the Windows platform. That saves me a lot of trouble. Going ahead, even further, if one could seamlessly run apps from one mobile platform on the other(like what VMWare Fusion or Parallels Desktop enable us to do) , then it would be really amazing and useful. If the virtual platform (VMWare's Mobile Virtual Platform for example) becomes popular enough, then mobile companies will start building their OSes for the virtual platform instead of tying up to a specific hardware. This would further increase its popularity and acceptance. Of course, this is easier said than done. But, one cannot say that things won't go that way in the future. This month has been very exiting so far :) Been to Goa with college friends and then, to Lohgad last Sunday with school pals. Both the trips were a lot of fun! Here some photos from Goa, and Lohgad. Use of GPS is becoming commoner every day. Already, there are tons of location based apps for modern mobile phones and many of them have become popular. Google recently launched a controversial one named Latitude. While reading up about GPS and related stuff, i came across this interesting idea- using TV signals (instead of GPS signals) to locate position. The method of positioning is roughly the same but, the hardware required will certainly be different. A company called Rosum has created a product which uses TV signals to locate your position (if you are in America). According to them, TV signal based positioning has many advantages over traditional GPS. More about it here. How much do you think noise would affect a (non solid-state) disk drive ? Phantom OS - the new kid on the block - a purely Object Oriented Modern Operating System. Its kernel can be called a microkernel. The OS does not have a filesystem, or separate processes and isolated address space. It has no support for C and assembler. Only 'managed' frameworks might be supported. 'Reboot' is redefined in the Phantom OS. 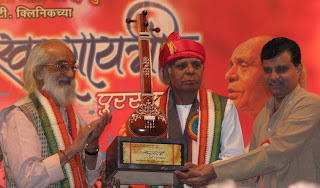 Last Sunday I went to the felicitation ceremony and concert of Khansahib Ustaad Saeeduddin Dagar at Tilak Smarak Mandir, Pune. The Dhrupad genre which originated in songs of deity workship is said to be at least 500 years old; much older than the popular Khyaal form we hear today. The Dagars are descendents of Tansen's guru Swami Haridas from the 15th century. According to Ustaadji, he himself is a ninteenth generation Dhrupadiya, and his sons twenteeth! Overall, the programme was well arranged. 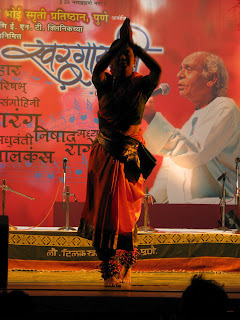 It was sure to attract crowd since, Ustaadji was performing in Pune after a gap of three years. 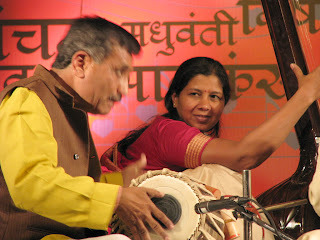 There are few Dhrupad gayaks in Pune and, even fewer Dhrupad concerts. Finally, it looked like this. Nice. 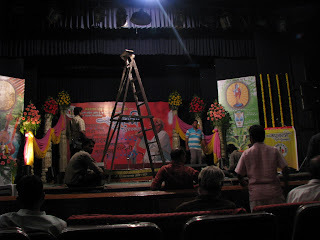 The programme started with Saraswati vandan. 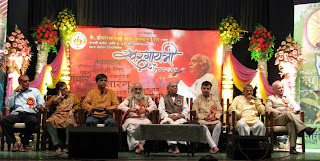 Guests on the dias - (from left) 3rd - Marathi music director Salil Kulkarni, historian Babasaheb Purandare, Dagarji himself, and Bhimsenji's shishya Upendra Bhat sitting second from right. 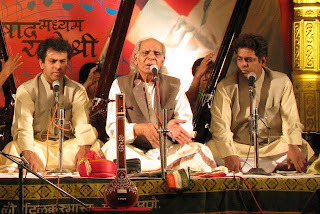 As is the Dhrupad tradition, the aalaap lasted lasted for a considerable amount of time. Ustaadji displayed some interesting meends during the concert. I am too inexperienced to judge, but considering his age of 70, I think he sounded great. Considering the time of the day, I was expecting Marwa or Pooriya or Multani or some other evening raga, but surprisingly he rendered Malkauns. I felt that a raga is a bit easy to recognize/appreciate in the Dhrupad style than in a Khyaal. May be, it is a newbie characteristic, but i have felt the same thing earlier too. 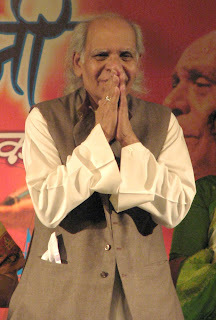 Dagarji after the performance, humbly thanking the audience and the organisers.